There are times when the most you can hope for a book is that you can read it, set it aside, and not completely hate it. So I must provide a caveat: I thought this would be one of those books. It was with some dismay that I found myself faced with the prospect of having to read this book (and yes, I had to read it for a class; it is not a book I would have chosen myself), because it is part of the “American Girls” series. You know what these are about: a series of identically-shaped dolls, differing only in color and dress, going for a hundred bucks a pop. It’s as if someone decided to make a line of Barbie’s for younger children, add the tags “multicultural” and “historical” to them (so that parents could at least justify the high cost as educational) and then develop a very clever marketing scheme around them, so that young children are encouraged not only to acquire every single doll in the series, but every single accoutrement available for them, including a never-ending series of books, guaranteeing that children won’t be happy until their parents have mortgaged and re-mortgaged the family homestead into oblivion. Oh, wait, that’s actually happened already. That said, this is not such a bad book. The characters are fairly well-drawn and distinct, always a challenge when writing about Native Americans (or Asians, or Latinos, or any other ethnic group). The text, which has just enough illustrations to engage young readers without distracting them, is easy to read, yet the use of many Nez Perce terms (fully defined in the glossary at the end) also encourages young readers to slow down and consider what they are reading (or to just skip over it altogether, although some meaning will be lost along the way). Here I come to the second-most troubling part of this book: its highly didactic nature. There must a certain pleasure for adults, I suppose, in that we no longer have to use a carrot-and-stick approach to induce children to adopt our behavioral expectations; all we have to do is give them a book in which those expectations are foregrounded and trust nature to do the rest. Of course, the nature of children is that they read books to be entertained, not inculcated. The same is true for adults, although we do our best to deny it. After all, no one reads Cormac McCarthy’s The Road to learn how to behave in a post-apocalyptic nightmare; they read it to be entertained. So yes, this book is didactic in nature, although the best that can be said about this aspect of it is that the book doesn’t come across as a heavy, thundering invective about how one should behave. Fortunately, children may read over the “instructive” parts of the book without noticing them, but they stuck out for me like Spock’s pointed ears. On the one hand, this theme doesn’t carry throughout the entire book, as Kaya learns her lesson when racing her horse and it bucks her off. On the other hand, it carries more than half the book, but it does not become terribly obtrusive to one’s reading. There is an advisory board, who “authenticaed Kaya’s stories” (whatever that means), which includes Vivian Adams, a “Yakama Tribal Member, former Curator of Native Heritage, High Desert Museum;” Rodney Cawston, “Colville Confederated Tribes;” Ann McCormack, “Cultural Arts Coordinator, Nez Perce Tribe;” Frances Paisano, “Nez Perce Tribal Elder, Retired Educator;” and Rosa Yearout, “Nez Perce Tribal Elder, M-Y Sweetwater Appaloosa Ranch” (whatever that means). Am I, as a reader, supposed to be impressed by all that? I doubt it, since the back cover says “Ages 7 and up.” I doubt most seven-year-olds are impressed by advisory boards. This is meant to appeal to the adults who actually fork over money for books. They can read the inside back flap, and say “Ooh, this book has an advisory board. It must be good,” at the same time not realizing that Louise Erdrich is actually an Indian writer, not just an advisor, because her name is “Louise Erdrich” and not “Flying Eagle.” It is one thing to have an advisory board, it is another thing to actually listen to their advice, and it is another thing altogether to document how their advice was incorporated into the writing. Just what does “authenticated” mean, anyway? That we gave them editorial control? Or that we gave $23 worth of beads so we could list their name on the flap? Of course it will. It’s easy to romanticize what has happened in the past (just look at the Little House books for proof of that). Romanticized notions sell to buyers of children’s books (who are rarely, unfortunately, children.) It’s pretty hard to romanticize alcoholism, discrimination, racism, double-digit unemployment, and cultural piracy. Since this book is about the Nez Perce, rather than the Sioux, it would seem like the publishers of this book didn’t do their homework, since they are primarily interested in sales. Of course, if they did do their homework by reading Sherman Alexie, they might just have closed up shop. Or they might just be, through their impressive marketing network, trying to prove Mr. Alexie wrong. No dogs here, but we do have some lovely horses and teepees, as well. There is a predictable pattern when non-Indians write about Indians: horses + teepees = Indians. It doesn’t matter if the Indians in question lived in teepees or longhouses, or actually rode horses or not. 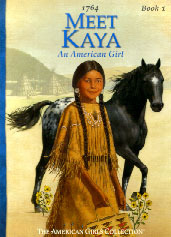 To credit this book, however, Aaleh (Kaya’s paternal grandmother) does spend some time talking about the time before the Nez Perce had horses; while discussing the advantages and disadvantages horses brought to her tribe, her hands trace the pockmarks on her face and she recalls the ravages that smallpox wrought upon her tribe. (Shaw 38-43). There is also a mention in the non-fiction section at the end of the book (“A Peek Into the Past”) that teepees were temporary summer lodgings; when the people settled back into their permanent winter lodgings, these were longhouses covered with the same tule (a type of reed) mats that covered the teepees. Unfortunately, it does, and it goes back to that romantic notion we all have of the Indian, either the “noble savage” who was at one with the earth and the elements, or the non-noble savage who killed whites, attacked wagon trains, and made off with white women and children. We seem unable to reconcile ourselves to these two extremes, unable to realize that Indian life cannot be reduced to an image, a picture, an icon. Still, this is not the worst book about Indians I have ever read. It does make an effort at verisimilitude, it uses actual Nez Perce words (although I have to doubt their authenticity), and it makes an attempt to represent Indians as real people, with real concerns. I especially love the scene during the courtship dance, when everyone thinks that Brown Deer doesn’t really like Cut Cheek (again, those names!) because she won’t look at him. Ironically, it is Speaking Rain, who is blind (oh, did I fail to mention that we can also tag this book with “disability?” Now if only one of Kaya’s younger brother’s had ADD or Down’s Syndrome, or some of the Indians at the dance were gay, we could really cash in) who can “see” the truth: Brown Deer won’t look at Cut Cheek because she really does like him. Even so, there are better books you could spend your time with. Read this one if you must (as I did), read Louise Erdrich’s The Birchbark House if you can (as I could). And then, by all means, read some Sherman Alexie, and some Simon J. Ortiz, and some Joy Harjo, and some…. Alexie, Sherman. “The Unauthorized Biography of Me.” One Stick Song. Brooklyn: Hanging Loose, 2000, 13-25. Shaw, Janet. Meet Kaya: An American Girl. Illus. Bill Farnsworth. Middleton: Pleasant Company Publications, 2002. Chapter book. Recommendation: if you have to. I don’t run ads on this site, so if you found this post useful or enjoyable, please support this site by sharing this post on your favorite social media by using the buttons above. If you would like to contribute to the server costs, you can also contribute via PayPal at paypal.me/kjodle. I appreciate your support. Powered by WordPress and the Atticus Finch Theme.